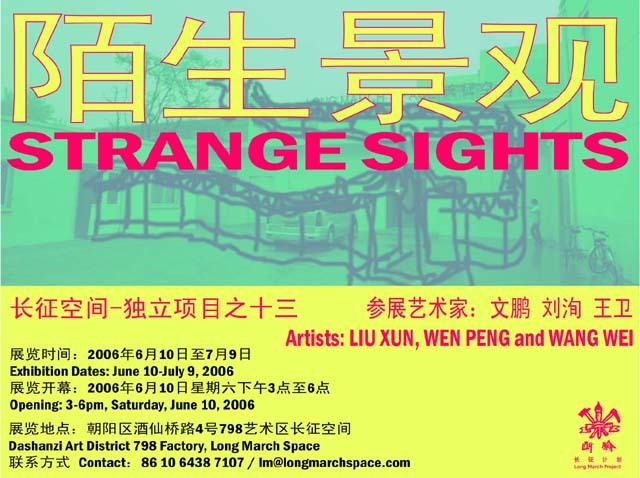 forgot to mention in my last post that those who are in beijing this weekend should head down to the long march space on sat afternoon (that's 'arvo' for those in the southern hemisphere) and check out the opening of "Strange Sights" by 3 artists: Liu Xun, Wen Peng and Wang Wei. Wang Wei is building a massive structure of scaffolding out on the patio (or front door, depending on how you enter the building). There will be a human sized chess game and video installation. those nutty chinese artists... wacky! Your cultural inclusiveness is appreciated.